Developing the rural areas of the country is very important for the overall progress of the nation. Mahatma Gandhi, the Father of the Nation had a specific view that was going to develop the rural areas into ideal villages. 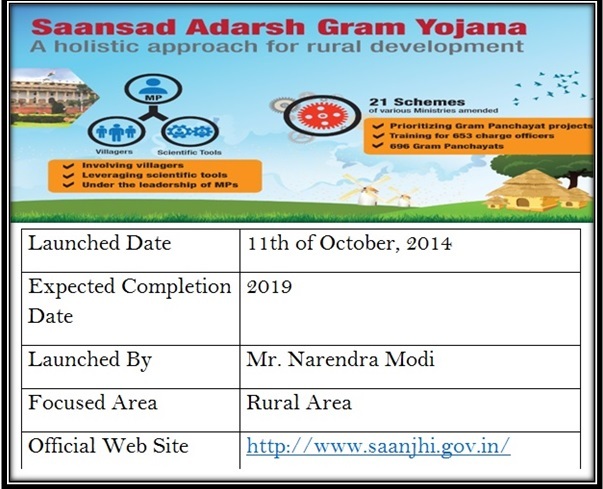 Based on these guidelines, the present government has designed the Saansad Adarsh Gram Yojana.Under the scheme, the government will be able to bring about social, cultural, and monetary development in the villages, which will be selected as the Adarsh Gram. All the aspects of the yojana will be based on the demands and the aspiration of the villagers. In this way, the government will be able to involve the local people of the villages and fulfill their requirements. The main of the government is to bring about holistic development in the rural areas and to bring almost 2,500 villages under the scheme by the end of the ear 2019. Apart from everything, the scheme has been attracting the eyes of all as it has been laid down that each of the MPs will have to take up the responsibility of developing the condition of three rural areas. Holistic development of the rural areas – Under the scheme, some of the villages will be selected and proper steps will be taken to develop the villages from root to tip. This will be started with the development and reformation of the Gram Panchayats. When the processes will be triggered, the scheme will be able to ensure that the villages are being developed in an overall or holistic manner. Developing both quality and standard of life in the villages – As the rate of development was not as fast in the villages as in the urban areas, the rural folks had to suffer from various kinds of hardships. With the implementation of the SAGY, the MPs, responsible for the development of the villages will ensure that the rural people are being provided with the facilities will improve the living standards as well as quality of life. Improving the over state of affairs – The main aim of the yojana is to develop the villages as ideal rural areas. So, the authority will have to work towards developing the facilities in these areas. Increasing the productivity, assisting in developing livelihood opportunities, enhancing human development, more social awareness and mobilization, augmented social capital are also aspects of the scheme. Apart from these, the scheme will also look after the reducing disparities between classes and access to entitlements. Creating model rural governance platforms – Another objective of the scheme happens to be developing the foundation and functioning of the Panchayat of the selected rural areas. It will assist in enlightening the government authorities of the other villages, located close to the selected village. They will be able to adapt the same features in their function and start the journey towards being a modern and model village. Training centers for rural governments – Last but not the least; the selected model villages will be governed as per the planned strategies for better governance. As these model villages function according to the planned steps, the other rural governing authorities (Panchayts) of other villages will be able to learn the tricks of the trade. MPs taking responsibility of rural areas – As it has already been mentioned that this feature is unique and has never been tried before. Under the guidelines, each and every Member of the Parliament will have to take responsibility of developing one village. The MP must not belong or have any connections to that village. The rural area must be developed within 2016 and then on, one village will have to be chosen by the MP for the reason, for the three consecutive years. The process will continue till 2024. Giving importance to rural location – As per the guidelines highlighted in the draft of the scheme, the villages must be picked from the rural constituencies. None of the villages must be picked, which fall in the urban or countryside areas. Separate economical plans for different villages – Not all villages can be governed as per the same strategies. It is all the more true in the economic aspects. Thus, each selected village will have different plans, which will assist in developing the financial foundation. These plans will be made for involving the poorest sections in the income sectors. Providing shelter and sanitation services – One of the biggest issues that people residing in the villages face is lack of sanitation. As the people in the rural areas are poor, they do not have access to permanent houses. Under this scheme, the homeless will be provided with permanent homes and sanitation services will be improved. Enhancing digital education systems – Most rural areas also lack the facilities of education. Each village selected under the scheme will be provided with enhanced digital benefits of education. The students will get the benefits of e-library, e-classroom, web-based teaching and universal entree to schooling till Class X. Improving the overall health sector of the village – The presence of health care facilities has also been an alarming issue. All the selected villages will have the strategies for improving the health care facilities. The people will get health cards, compete immunization and free medical checkups. Other improved amenities – Apart from the access to improved health care facilities, shelter and sanitation, the selected villages will also get access to improved road construction. The villagers will get pure and clean drinking water and for this, pipe lines will be laid down. The rural people will get electric connections, libraries will be established and IT facilities for internet connection will also be provided. E-governance – The central government, under the leadership of Modi has already put emphasis on the implementation of e-governance. All the selected villages will be connected with the e-governance facilities for better control. Providing Aadhar card – As per the Aadhar initiative of the central government, all citizens of the nation must have access to their Unique Identification Code. Without this, people will not be able to take advantage of government schemes. All selected villages will be registered under the Aadhar scheme. Providing monetary security – The government has already launched many social security packages for providing insurance packages to the old and the physically challenged. All selected model villages will be brought under these schemes to, like Public Distribution System and Aam Aadmi Bima Yojana. Widow pension will also be provided to the eligible candidates. Apart from the other selection categories, which have been mentioned in the earlier parts, any village, in the plain areas, will be selected if the village has a total population of 3000-5000. The population total changes when considering any area in the hilly states. Here, the total population can be 1000-3000. There are no extra points in guessing that the task of developing the villages and giving them a modern look will require a lot of money. The central government has not yet identified a separate or special fund that will only cater to the monetary needs of this scheme. The central government will be raising the necessary amounts from the schemes, which have already been implemented like Pradhan Mantri Gram Sadak Yojana, Indira Awas Yojana, Backward Regions Grant Fund and Mahatma Gandhi National Rural Employment Guarantee Scheme. The second source of funds will be the MPLADS. The full form of MPLADS is Member of Parliament Local Area Development Scheme. As per the guidelines of this scheme, the MPs will be given the required sum for bringing about development in the areas. The gram panchayat has its own revenue funds. A certain section of this revenue will be utilized in the best ways in reshaping the present and the future of the selected villages. The governing authority of the selected villages will also receive the grants from Central and State Finance Commission. These funds will come in handy while bringing about overall development in the rural areas. All the major business houses have to contribute towards the development of the society. It is termed as Corporate Social Responsibility. Under this sector, the business houses donate a percentage of their profits so that it can be used for the development of the overall nation. Financing the Sansad Adarsh Gram Yojana will be done via Corporate Social Responsibility funds. For getting more information on the program or clearing any doubts that you may have, it is better to check out the official website of the scheme. One will be able to reach the homepage of the webpage by clicking on the link www.saanjhi.gov.in. With the implementation of the scheme, the government will be able to take a firm step towards the betterment of the villages on an all-inclusive level. Though the opposition has sighted some problems in the utilization of the funds, the government is positive that they will be able to tackle the hurdles and achieve success. After the successful completion of the Saansad Adarsh Gram Yojana or SAGY Phase one, Ram Kripal Yadav announced that it is time to begin the second and third phase of this scheme. During the 2nd phase, 478 MPs will select their villages and during the 3rd phase, 218 MPs will take their picks. All pertinent information has been made available for common people. To access these details, one needs to click on the official site of this scheme, i.e. saanjhi.gov.in. When MPs take up the charges of bringing about the development of a certain village, they do all in their power to uplift the financial status of that area. The central government grants funds to implement developmental programs in these villages. Govt.of yojana for study in computer center any prashikshan Kendra .